Our socks are Cotton, so can be washed in machine if required. You can also tumble dry and iron all of our cotton socks. Handmade in the UK by Silly Old Sea Dog. 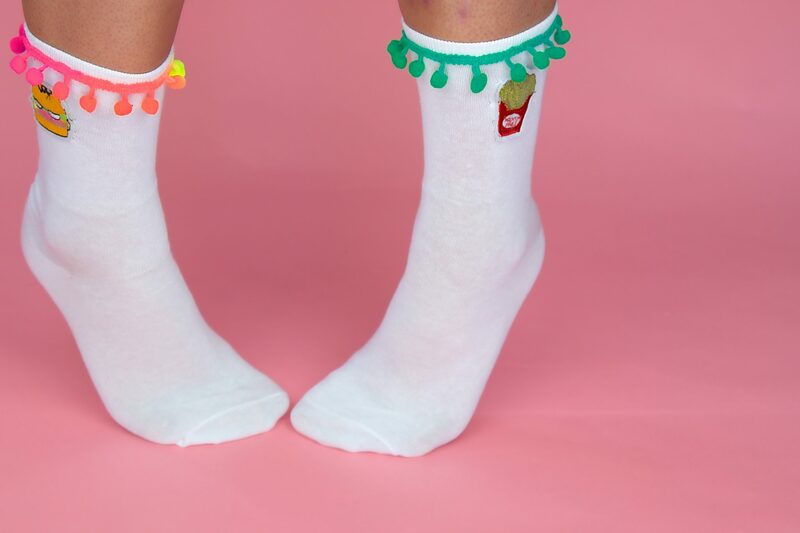 Our socks make ideal gifts. The socks themselves are 70% Cotton and 30% Elastane. The frilly trim is 100% cotton. 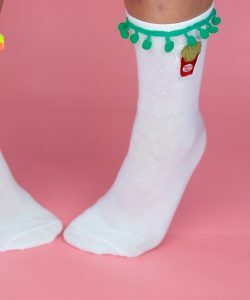 White Socks with multi coloured bright pom pom trim (please note trim colour may vary slightly from images, as the pom poms are sewn from a multi-coloured strip, which varies in different bright colours of orange, green, blue, yellow and pink). On one ankle there is a burger and the other a fries motif. Sock size: Suitable for UK 4-8 ( EUR 36-42 / US 4-9). Fun and funky socks with handmade trim, to bring a little colour to your outfit or to match with your Silly Old Sea Dog Dress. Silly Old Sea Dog’s studio is based in Newquay, UK where our items are designed, our hair accessories are all made here by our local team. We are passionate about producing in the UK and offering something different from that available from the chain stores. Many of our hair accessories have coordinating dresses. Our collection of dresses are all designed in Newquay and then produced by our small factory in Scotland. We design all of the patterns ourselves and produce them in quality designer cotton fabrics. We ship our garments all over the world – For accessories delivered in the UK they should arrive within 1 week of order, for European deliveries within 2 weeks and for Worldwide destinations they can take up to 3 weeks. Faster shipping options are available for all of our products.